I uploaded 21 videos of 2010 value investing lectures into a sub-folder in the VALUE VAULT. The VAULT seems cluttered so unless anyone objects, I will place non-videos into folders with sub-categories for easier searching. I will choose a quiet time to work on the vault—probably Sunday. If you are having trouble opening the folder, please contact www.yousendit.com customer service at 888-535-9442 or (outside the USA) 1-408-385-8491 and email me if the problem has or hasn’t been fixed. I will #$%^&*! find out the problem. I am having no issues accessing the folder or videos so far. If anyone has an idea for a more accessible storage option, let me know. This strategy of controlling everything (operating system, hardware, software licenses/developers, content delivery, etc.) is, according to Greenwald, a competitive liability, yet today, as Apple is the most valuable company in the world and the most successful tech company, it is the very reason given for their massive success, and the “special genius” of the recently departed Jobs. What gives? Is Apple just a fad? Is Greenwald making stuff up? Or is there some other piece of this puzzle I am not considering? The Reader follows up with: “I thought of another strategic element for Apple. I read this somewhere a few months ago, don’t remember where, but Apple basically made exclusive contracts with its various suppliers such that they guaranteed them large volume up front in return for them not taking orders from competitors, essentially (some arrangement like that). First, conferred a competitive advantage in supply to Apple because they were able to achieve lowest cost in production. Second, accomplished the strategic goal of totally denying their competitors access to suppliers of similar quality/cost. This meant that the only way a competitor could create something of Apple quality would be to pay (and charge) a lot more for it. But Apple commanded a brand premium in the market place while the competitors did not. This would be a good example of the Jarillo principle of the premium company charging less than they could, forcing competitors who don’t command a premium to price near cost. I think normally the issue of “what suppliers do we use and how do we contract with them?” would be tactical. But because Apple interfered with their competitors’ ability to compete by working with suppliers the way they did, this seems to be a strategic consideration as well. My reply: Like a lecturer before an audience, I was hoping no one would notice that my fly was unzipped. The reader is mentioning the elephant in the room–did Steve Jobs read Prof. Greenwald’s Competition Demystified and just do the opposite–Apple has a closed system for hardware and software. 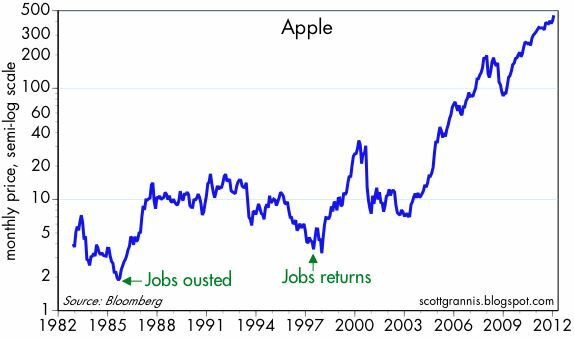 Has Apple been successful? Prof. Greenwald has missed something in his approach to strategy. Apple may be using elements of strategic logic to be successful like economies of scale, customer captivity, network effect, and patents. Steve Jobs may be a genius who invented an industry or product beyond the immediate scope of strategic analysis. In other words, you can’t analyze the reasons for success of someone who invents the cure for cancer or a process that turns an element into a resource. You can’t predict genius. Who said strategic thinking would be easy. Let’s take our time to look at a problem from all sides and go through our strategic logic process. We will soon discuss the Coors case study and then move on to Chapter 6: Compaq and Apple in the Personal Computer Industry or pages 113-136 in the book. Once we have finished the book and all the cases, let’s circle back and study Apple’s current success. One question that should slap you in the face, “Why does Apple have such a low multiple of earnings and cash flow?” Perhaps the market does not believe that Apple can have real growth and/or the genius of Steve Jobs will no longer drive Apple’s future. Should the government tell you how to live? We all have our prejudices. Here is how to deal with them.